Jamie Lennon in action for St. Patrick’s Athletic. DCU Soccer play in the Collingwood Cup Quarter-Finals tomorrow in UL against University College Cork. Head coach Declan Roche spoke to The College View about his side’s chances in the competition, coming up against 13-time winners of the competition in the form of UCC. “UCC are one of the favourites to win it, they always have a very strong team. We’ve had great battles with them over the last few years. “From our point of view, we have very much a change in our squad plans. We’ve lost a lot of senior players over the last couple of years,” he said. Roche also notes how a lot of players in the college play in the Airtricity League, and getting them available to play is quite difficult, leaving him with limited options. “In terms of the league campaign and for Collingwood, we knew we were going to be using a lot of Fresher’s players for both the Collingwood and the Harding together. “But we hope to have some of our senior players back in for the tournament,” Roche said. “Overall we’re going to try and do the best we can. It’s important for the first and the second year players to play in the Collingwood. “There’s two trophies on offer for the week and we’re hoping to come away with one of them anyway,” Roche stated. Johnny McDonnell’s men head to Limerick after a disappointing league run, where they only managed two points from five games. They did show improvement as the campaign went on, however, with those two draws coming against IT Sligo and then Trinity in their final game. DCU also put up a courageous effort against Maynooth, who finished third in the Premier Division North table, only losing 2-1 in a close encounter in St. Clare’s. DCU will have to make do without midfielder, and captain, Jamie Lennon, who is unable to participate in the Collingwood Cup due to being called up to an Ireland U21 training camp by Stephen Kenny this weekend. Roche is also quick to support the midfielder and recognises what an achievement this is for the St. Patrick’s Athletic midfielder. However the delight of Jamie making Stephen Kenny’s panel is met with the disappointment of knowing that Lennon won’t be there to strengthen DCU’s chances in the Collingwood Cup. “Obviously there’s a sense of disappointment that such an event has been put together the same week as the Collingwood. It has an impact on us in DCU and also for UCD and indeed Limerick. 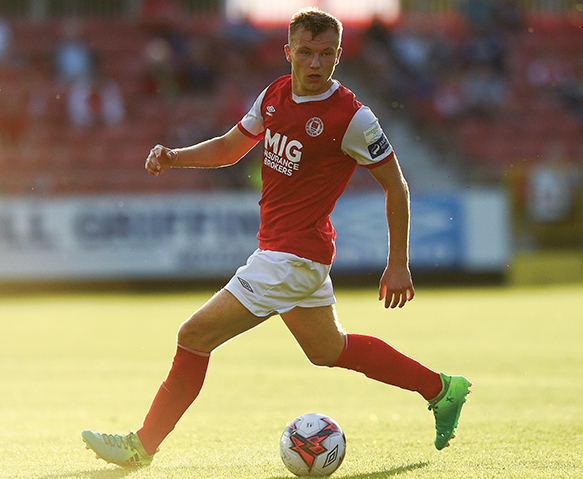 The St. Patrick’s Athletic player has said himself that he would love to have participated in this year’s cup and represented his college one final time, but that the opportunity was simply too good to pass up. The other quarter-finals see Ulster University take on Royal College of Surgeons, after the Northern Ireland college saw off NUI Galway. Queen’s will face up against UCD in a repeat of last year’s final following UCD dispatching Mary Immaculate College in the previous round. Lastly, hosts UL will take on Maynooth, after the Kildare university overcame Trinity in the first round in controversial circumstances. Image Credit: Matt Browne / Sportsfile.